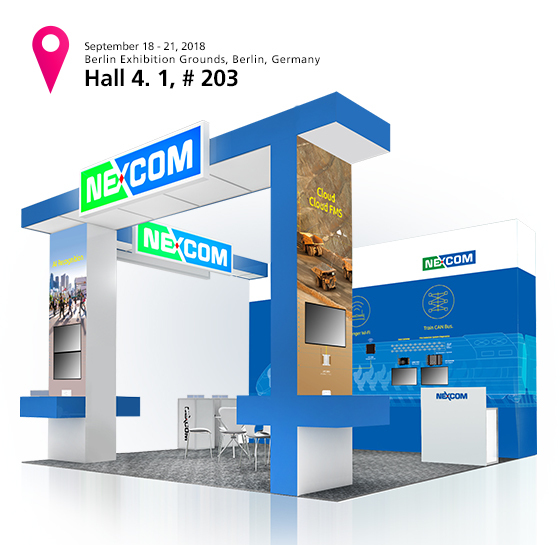 You are cordially invited to visit NEXCOM’s Booth at Hall 4.1/203 in 2018 Innotrans exhibition which will take place on September 18th to 21st in Messe Berlin, Germany. Internet of Vehicle (IoV) and Artificial Intelligence (AI) continue to push the transformation of all market sectors in the transport industry. We see a great opportunity in the passenger transportation and public services to integrate IoV and AI technology as the key to winning future business in a thriving and sustainable service model. At this exhibition, NEXCOM will present demonstrations on the applications of object detection, mobile surveillance, and cloud with edge computing. NEXCOM will also illustrate the new GPU-based solutions based on Nvidia’s latest technologies, which is a platform built from the ground up for building transport applications such as Autonomous driving.. Please mark your calendar, reserve the time slot, and join the conference. We are looking forward to seeing you at Hall 4.1 , Booth 203.